Kite lessons, how to launch a kite, how to land a kite. Launching & Landing your kite. 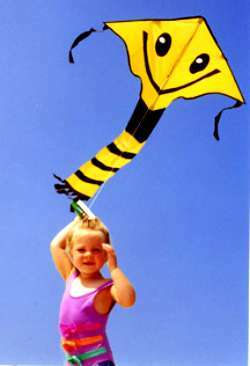 Single line kites are usually the easiest to launch and can be done by yourself without the need of a helper. Most of the time you can simply hold the kite up with one hand while hanging onto the line with the other. When the wind catches the kite release it and begin flying. Today's kites are superior in design and in materials, you no longer have to run across the park to get your kite in the air (unless you are a young child and then it is just plain fun!). Some kites are supplied with tails, not all kites will need a tail. Tails use to be used to help stabilize your kite while it was flying, today tails are mostly used for decorations and are not always necessary for proper flight. Once your kite takes air, begin to let your line out in controlled speeds, letting your line out too fast will take the wind out of the kite and it will begin to drop in altitude. If this happens, stop letting out your line and your kite should begin to raise again, sometimes you may need to give it a slight tug on the line to get it moving again. To land, simply start winding up your line and bring the kite in to you. When the kite gets within arms reach, reach out and grab the kite by either the bridle line at attachment point of your flying line or on the leading edge of the kite. By holding onto the leading edge of the kite you should be able to keep the kite in control very easily. There are thousands of different styles of kites and your technique on holding onto the kite while it is on the ground may need to be different than the above way, the main thing to watch out for is that the wind doesn't catch the kite and put any unnecessary strain on it while you are hanging onto it. Tremendous amount of strain on a specific point of your kite could tear the kite or break the spars/frame. Multi line kites are quite a bit different than single line kites. You usually fly these types of kites on a fixed lenght of flying line instead of a large spool of line you let out during flight. Dual line kites are usually flown with flying straps that you place your hands through, you don't always have to have your hands inside of the straps and can fly by just hanging onto the ends of the straps with your fingers. After setup, your lines should be fully extended and attached to your kite on one end and to your flying straps on the other. Carefully pick up your straps from your kite stake making sure that you do not pull your kite over onto it's face, your kite should be leaning back in the wind and there should be some tension on your flying lines. Take a step or two backwards to stand your kite upright as straight as possible without having it self launch or fall forwards. With your hands even with each other and fully extended in front of you, bring your hands down to your sides with a firm but smooth stroke. If you are launching in lighter winds, you may need to take a step backwards while you perform your launch to make sure your kite gets a good launch. Your kite should rocket towards the sky, keep your hands held down to your sides until the kite has reach a very good and stable height. Once your kite is fully in the air, slowly begin to bring your hands back forward into normal flying position. If your kite crashes into the ground, you may have difficulty getting it relaunched. There are several different techniques you can use to relaunch the kite once it has hit the ground in various positions. If the kite is on one wing tip with the nose laying against the ground you can try rocking the kite back and forth on its nose and should be able to get it to lay on one wing tip and then the other. Depending on the wind and the style of the kite, you can sometimes rock it enough with a little finess and get the kite to rock all the way over back onto its wing tips and into the normal launching position. If you can't get the kite to roll all the way over onto its wing tips, roll the kite so that the nose of the kite is pointing towards the closest edge of the wind window. Once in this position, slowly walk towards the opposite side of the wind window while giving a little tension on the wing tip that is in the air, the kite should begin to drag across the ground towards the edge and eventually turn up off of the ground into the air. If the kite is laying flat on its back with the nose away from you, you should be able to take a couple steps backwards until the wing tips snag and stand the kite up into the normal launching position. If the kite is laying on its belly with the nose towards you, you can sometimes give sharp tug on the flying lines immediately followed by another quick tug, the first tug will drive the kite down into the ground and then bounch the nose of the kite up off of the ground, the second tug needs to be done at the exact same time the nose comes up off of the ground. If done properly and at the right time, the kite will bounce up off of the ground and begin flight. The previous launch is one of the hardest launches to do and on some kites it may not be possible because of the kites design. If the kite is laying flat on its belly with the nose of the kite away from you you may be able to reverse launch the kite. Give a firm smooth pull on the lines similar to a normal launch, the kite should catch the wind and fly backwards up off of the ground, once the kite gets as high as possible (usually about 1-2 feet off of the ground), pull on one line while pushing on the other to get the kite to quickly turn and resume flight. All of these launches as well as landings and many other stunts are described and demonstrated in the Prism Freestyle Pilot DVD. This DVD is highly recommended for any pilot who is getting into the sport of stunt kite flying. Landing a dual line stunt kite is quite difficult to master but once you start to get the hang of it it will become very easy to do. Before you can land, you have to learn how to stall your kite. Your kite must stall first before it can land. Stalling the kite is simply getting your kite into a position in the air without any forward flight. Flying the kite to the extreme edge of the window is a stall - the kite will stop moving forward and in some cases, begin to float backwards. To land your kite, first put the kite into a stall, if the kite begins to float backwards even better. Once the kite is stalled, start to move forwards towards the kite in a smooth and even motion and the kite will begin to float backwards and down towards the ground. Continue to move forwards until the kite lands softly on its wingtips. You may have to give subtle tugs on the flying lines to keep your kite in the right position to land. In stronger winds you will have to walk forward faster than in lighter winds. It is always best to practice these and other stunts in lighter winds until you get the hang of it. With a little practice in the right conditions you will be able to launch and land your kite easy and effortlessly. Launching a quad line kite is different than launching a dual line kite. With a quad line kite you can change the angle of attack by rotating your handles (or bar) forwards or backwards (towards you or away from you with the bar). By changing the angle of attack on the kite, you will be changing the flying characteristcs of the kite from forward flight to stalls to reverse flight - regardless of wind conditions. If you are launching power kites, always make sure you have plenty of room down wind from you in case you get dragged or something goes wrong. Always look around you for any obstacles that you might trip over around your launch area. Don't forget to look behind you as well, many accidents are caused by pilots tripping over something they did not know was behind them. If you are launchin a power kite in stronger winds, you may want to walk around to the side of the wind window to launch instead of doing a direct down wind launch. By moving to the side of the wind window, you will take a lot of the power out of the kite during the launch and will not be dragged as much. In stronger winds, always immeidatley drive your kite to the closest edge of the wind window to reduce the power and to keep your kite in control. If you are new to kiting and especially power kiting, alway practice in light winds until you are confident and comfortable with your skills. It is always better to launch with too little wind than to find out in the emergency room that it was too much wind. Launching a quad line kite is very simple. To launch a quad line kite, pick up the handles (or control bar) and walk backwards to take any slack out of the flying lines. Once the lines are fairly tight, quickly and smoothly pull and rotate the tops of the handles towards you while keeping the handles even in the same position. The kite should jump off of the ground and then continue to rise until reaching zenith. Once the kite has reached zenith, slowly and evenly extend your hands back to the normal flying position keeping the majority of the tension on the top lines of the kite. If your kite lands upside down, you can reverse launch it off of the ground the same way as you launch the kite right side up except you will pull firmly on the bottom of the handles instead of the tops. Both quad line stunt kites and power kites can be reverse launched. Stunt kites are easier to reverse launch and can fly in reverse rather easily, power kites generally do not have very good reverse flight and once they come off of the ground should be turned quickly around to continue flight. The Revolution is one of the best quad line sport kites on the market and when purchased with the complete kite, comes with a comprehensive VHS tape or DVD video that will teach you how to fly, launch, and land your kite as well as the many stunts and tricks the Revolution is capable of performing. For anyone who is interested in getting into quad line flying regardless of power kites or stunt kites, we recommend starting out with the Revolution, it is not only a very fun kite to fly but will give you the necessary skills required to fly ANY quad line kite on the market. To land your quad line kite, put the kite in the landing position and slowly rotate the bottom of the handles towards you while letting out the top. This will put your kite at a negative angle of attack and the kite should stall and begin reverse flight. Keep the handles held evenly in this position until the kite settles on the ground. During reverse flight you may need to give one handle or the other a little finess to keep the kite straight and even upon its decent. With ram-air sytle power kites, you may find yourself in an extremely overpowerd situation and may not be able to safely land your kite. If this happens, one thing you can do is put the kite directly overhead and place both handles together, reach up with one hand and grab the brake lines (bottom lines) about 2-3 feet away from the handles and give them a firm pull while letting the handles out away from you. This will cause the kite to flatten out and lose shape, dumping nearly all power from the kite. The kite may take a little while to finally land on the ground but it will be in control and de-powered. NEVER wrap any lines around your hands or any other part of your body and always be prepared and able to fully release yourself from the kite in the event of an emergency. Safety is always first and the cost of a new kite is always cheaper and less painfull than a trip to the emergency room!